Acid-loving plants require rich, organic soil to grow and produce healthy-looking plants that live up to their full potential. Acidic soils tend to occur in moist climates, although one of the best ways to know if your soil offers enough acidity requires taking a soil test to determine the pH balance. For gardeners who need to improve their soil, a mix of Canadian peat moss, soil and sand works well to give the planting area the right acidity. When it comes to choosing from a variety of acid-loving plants, rhododendrons fit the bill. The genus Rhododendron, consisting of both rhododendrons and azaleas, features more than 1,000 species of plants. Rhododendrons come in all sizes, shapes and blossom colors, with most of the plants blooming in late winter to early summer. 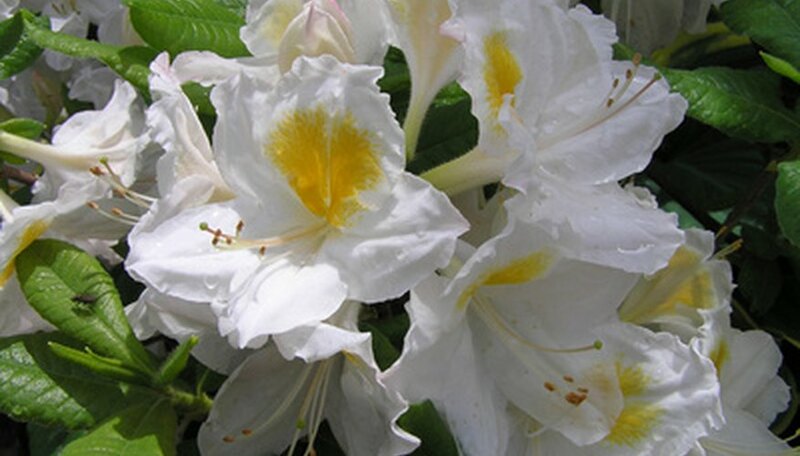 Most rhododendrons thrive in moist, acidic soil where they receive dappled sun to full shade. The plants require protection from drying winds. Since flower buds start appearing months before actually blooming, some of the early-blooming rhododendrons may need protection from late spring frosts. A native of the eastern United States and Canada, northern bayberry grows up to 12 feet in height and width. The slow-growing plant features glossy, dark-green leaves that release a pleasant aroma when crushed. The female plants produce clusters of bluish-black fruits with a waxy coating. The perennial plants prefer to grow in acidic soil in full sun to partial shade, although they tolerate a variety of soil and moisture conditions. The berries are used to make bayberry candles and soap. Birds also find the berries an attractive food source. Highbush blueberry thrives in wet or dry soil and full sun or full shade, as long as the soil remains acidic. This acid-loving plant grows up to 12 feet in height and width, producing blue fruits prized by wildlife and birds. In the spring, reddish-green spring leaves appear first, followed by white or pink bell-shaped flowers forming long dropping clusters. During the summer, the leaves turn bluish-green while the green fruit ripens into mature blueberries that bears, game birds, songbirds and other mammals use as a food source. Deer and rabbits also eat the twigs and foliage of highbush blueberry. For changing colors through the seasons, scotch heather works perfectly. In the spring and summer, the acid-loving plant features foliage in shades of silver, yellow, gray and green. New growth comes in shades of pink, yellow and orange. In the fall, the foliage changes to hues of red, orange, bronze and dark green. The flowers also add plenty of color, appearing in late summer and early autumn in long clusters of pink, purple or rose blooms. Scotch heather grows up to 3 feet in height and width, and prefers moist, very well-drained acidic soil in full sun.